The benchmarking test was conducted with the following configurations to demonstrate the need for dedicated server computing and the break-point for multi-server load balancing and failover. A server’s degradation point was reached when its score fell below 80. The results showed a maximum of 177 simulated users concurrently running Microsoft Office applications before this threshold was reached. 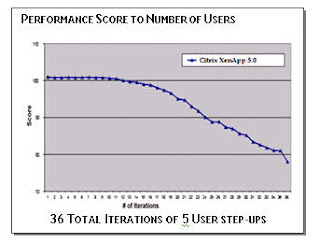 In this test environment, increasing the number of concurrent users beyond this would have resulted in decreased server and end-user performance. Most production environments deploy applications with much higher system resource requirements that reduce the maximum number of users supported by a single server before performance degradation. Server scaling is environment specific based on application overhead and end-user interaction classified as task oriented or power usage. This test was based on task oriented only. Dedicated computing is required regardless of circumstance. 1. Resource Usage: Citrix, a database driven application, makes usage of the server's hardware and operating system resources in a proprietary way that can be incompatible with Visual Database processing and performance. 2. Security & Continuity: Enabling end-user access to a database server for the purpose of hosting virtual work environments puts the production VISUAL Database at risk for a mission critical failure due to unrelated server usage. 3. Hardware Compatibility: VISUAL Database servers operate most efficiently on a Disk Subsystem configuration of RAID 1, 5. Multi-user servers operate most efficiently on a Disk Subsystem configuration of RAID 1 for simultaneous read/write operations. In addition, memory allocation switches differ between Citrix application servers and VISUAL Database servers when configuring virtual vs. conventional memory usage.